I like to cook, but getting food on the table has been mostly a chore lately. When a friend on facebook offered a referral to try a week of Plated for free, I decided to give it a try. Plated is one of those companies that delivers chef-designed recipes and all the ingredients you need right to your door. All you need are basic pots and pans, olive oil, salt and pepper. You choose the recipes from a short list. Most of them are $12/plate or $24 for the meal for two, though they do offer some premium options as well. Because the meals are almost all protein and vegetables, we easily stretched these to feed all four of us by adding a starch or another simple side. Before I tried Plated, I had my doubts. But the recipes have mostly turned out as good as they looked and the quality of the ingredients is obvious. 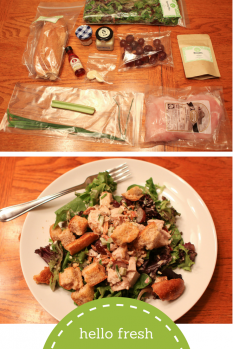 Everything comes in a big box, but it’s gathered together by meal and labelled well. I am more likely to be adventurous and try new things because there is no waste. In nine meals with Plated we’ve used 116 unique ingredients! Even with all the new experiences, we’ve had several recipes that went over well enough with everyone that they will go into our regular rotation, like the Steak and Zucchini Gyros with Pesto I’ve already made again. One of the obvious risks with this sort of service is that in the process of boxing and transport, food won’t be as fresh as it would be from the grocery store. For the most part, I’ve been pleased, but one meal my lettuce had gotten a little bad on the outside and tasted a little bitter. It was still useable, but I was curious about Plated’s customer service so I wrote them a polite, two-sentence email. Within 24 hours they had credited my account for $12 (half the cost of the meal) and apologized. As much as I like Plated, sometimes the offerings are a little exotic for our family, so I decided to give another company a try this week. Hello Fresh has a very similar model and pricing (details and referral code at the end of this post) but their menus seem a little more mainstream. Last night we had Sonoma Chicken Salad, tonight we’ll have Ginger Marinated Steak Wraps and tomorrow we’ll have Shrimp Po’Boys. Having the meals partially prepped with colorful recipe cards has made it easy to get the girls more involved in the kitchen. Kate can almost (but not quite) do the easier meals on her own, and I see her gaining skills and confidence as she works on them. Getting ingredients delivered may not be the cheapest way to feed a family but not spending as much time planning and shopping is very helpful and worthwhile. Also, I am not sure I could make equivalent meals much more inexpensively. When I made the Steak and Zucchini Gyros with Pesto again on my own, I spent more than $24. I do have some extra pine nuts to show for it, and a meal or two more worth of pesto in my freezer. However, I had to go to two stores to get all that I needed and I spent a lot longer in the kitchen when I had to make my own homemade pesto instead of getting just the right amount of high-quality pesto (tasted handmade and was sent in a big condiment cup) in my box, ready to go. All in all, this has been a fun experiment and I plan to continue getting boxes from each company periodically when the menu look good and it works for our week. Though they are subscription services, both of these websites make it really easy to skip weeks. I am hoping it is a good way to keep us eating healthy and at home through back-to-school craziness and football season. Hello Fresh has given me a referral code for new customers, so if you want to give it a try, you can save $40 on your first box, making the $69 box only $29 for 3 meals for two people. Just enter DX5BZ2. I don’t have any now, but if I get any free box referrals from Plated, I will share on facebook or twitter. This entry was posted in feasting. Bookmark the permalink. We did HelloFresh for a couple of weeks. 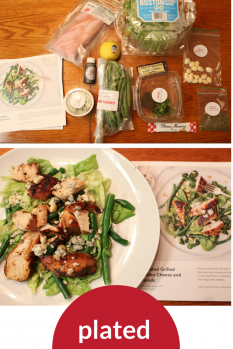 The recipes were solid (and available online without subscription), but we were a little turned off by all the packaging. I don’t suppose there’s a better way to move perishable food, but it seemed weird getting a little plastic bag with two cloves of garlic or a tiny, tiny bottle of white wine vinegar.